Duct work is an essential part of a home’s energy performance as it is the distribution system of conditioned, filtered air throughout your house. Most duct systems are located outside your conditioned space, usually in the attic or crawlspace. Why are they important? During the heating and cooling seasons, your heating and air units are working hard and the duct system is the delivery system that conditions your home. What if your ducts leak? Or worse, disconnected? How do you know if they are leaky? If your ducts are leaking, you are conditioning the outside space your ducts are located, such as the attic or crawlspace. In other words, those are dollars out of your pocket. And because you are conditioning extra space, your unit works even harder with a final result of either comfort issues, air quality, high bills, or all of the above. The picture above is an example of a disconnected duct that we repaired and sealed and the picture to the right shows a home’s duct system. A prescriptive seal is when your duct system has low-to-moderate leakage. Our crews perform certain pressure tests to determine the high leakage areas and only hand seal those areas. This is a great low-cost and effective option. A strip-and-seal is a complete system seal. The current duct insulation is removed, our crews hand seal every seam and connection by hand, and then the system is re-insulated. This is usually the most expensive option but usually more effective. AeroSeal is a new technology that seals ducts from the inside. Our AeroSeal-certified crews pressurize the duct system that allows them to inject a sealant. As the sealant tries to escape through all the leakage areas, it closes it and then hardens like cement. This is a great option where ducts are inaccessible or the insulation is still in good condition. Sometimes duct efficiency work involves new duct work installation. When ducts are rusted and in terrible condition, new duct work is generally the solution verses duct sealing. 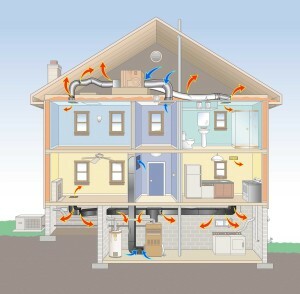 You can get your ducts tested by getting a home energy audit completed. You can sign up by clicking here.